Los Angeles Lakers All-Star LeBron James has missed the playoffs for the first time since the 2004-05 NBA season. The Los Angeles Lakers announced that LeBron James will be shut down for the remainder of the season so the GameTime crew discuss what is next for them both. The Los Angeles Lakers announced that LeBron James will be shut down for the remainder of the season. 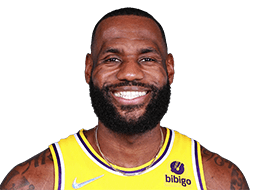 PLAYOFF CAREER: For his postseason career, has appeared in 199 playoff contests (all starts) with averages of 28.0 points, 8.8 rebounds, 6.8 assists and 1.8 steals in 42.1 minutes per game…three-time NBA Finals MVP and champion (2012, 2013, 2016)…ranks among the NBA postseason all-time leaders in triple-doubles (16, 2nd), free throws made (1,355, 2nd), assists (1,348, 3rd), scoring average (28.0, 5th, min. 5 games), points (5,572, 4th), field goals made (1,965, 6th), steals (354, 4th), three-pointers made (287, 5th) and rebounds (1,758, 9th)…is the only player to rank in the Top 10 in points, rebounds and assists in NBA playoff history…is Cleveland’s postseason leader in points, scoring average, field goals made, three-point field goals made, free throws made, assists, steals, blocks and minutes…has scored in double figures in 197 postseason games, including an NBA playoff-record 176 contests with at least 20 points, 84 of 30-or-more points and 17 of 40-or-more points (five in Finals competition)…the only players with more 30-point playoff games are Michael Jordan (109) and Kobe Bryant (88)…has amassed 87 double-doubles and 16 triple-doubles…holds 63 career playoff games of at least 30 points, five rebounds and five assists, the most in NBA history (Michael Jordan is second with 51 such games)…has been his team’s outright leader in points, rebounds and assists in 38 postseason games, the most all-time and 25 more than the player with the next-most, Larry Bird with 13…played in six straight NBA Finals (2011-2016), the only player to do so since the 1960s Boston Celtics (Bill Russell, Sam Jones, K.C. Jones, Satch Sanders, Tom Heinsohn, Frank Ramsey and Bob Cousy)…is the 2nd player to play in at least three NBA Finals with two different teams, joining Dennis Rodman (Pistons and Bulls)…his seven triple-doubles in the NBA Finals only trails Magic Johnson (8) for the most all-time…has three triple-doubles with 30-plus points in NBA Finals competition, matching the total for all other players in the shot-clock era (Jerry West, James Worthy, and Charles Barkley had one each)…has eight career games with at least 30 points, 10 rebounds and five assists in The Finals, the most all-time…has the most 20-point triple-doubles in NBA postseason history (14)…scored at least 20 points in 25 consecutive playoff games from May 20, 2015-June 2, 2016, the longest of his playoff career (prev. 24 straight from May 12, 2008-April 25, 2010)…his teams have won at least one road game in 26 consecutive series, the longest in NBA history…started all 21 games during Cleveland’s championship run in the 2016 Playoffs…averaged a team-high 26.3 points on .525 shooting, 9.5 rebounds, 7.6 assists, 2.33 steals and 1.29 blocks in 39.1 minutes…had a 2016 Playoff-high +209 plus/minus and posted a team-best 13 double-doubles…recorded 552 total points, the 6th postseason he has tallied 500 or more points, second to Michael Jordan (8 postseasons)…shot at least .500 from the field or better 15 times and swiped at least two steals in 18 of the 21 playoff games…in the First Round against Detroit, posted three double-doubles and averaging 22.8 points, 9.0 rebounds, a team-high 6.8 assists and 1.8 steals in 41.2 minutes…against the Hawks in the Second Round, averaged 24.3 points on .507 shooting, including .421 (8-19) from deep, 8.5 rebounds, 7.8 assists and 3.0 steals in 36.5 minutes per game…in the ECF against the Raptors, averaged 26.0 points, 8.5 rebounds, 6.7 assists, 2.0 steals and 1.0 block in 36.5 minutes; his .622 (61-98) shooting percentage was just shy of breaking his highest field goal percentage in a playoff series (.627 in 2013 First Round)…on May 17 against Toronto, shot 11-13 (.846) from the field for 24 points in 28 minutes; in the first half, shot a perfect 7-7 from the floor, marking the first time in his postseason career he shot perfect from the field in any half…his .846 mark for the game was his highest field-goal percentage in a playoff game and the 3rd-highest for any Cavaliers player in a playoff game in which he took at least 10 shots from the field (Larry Nance 11-12 vs. Chicago in 1993; and Drew Gooden 11-12 vs. Washington in 2006)…won his 3rd Finals MVP after averaging 29.7 points (208), 11.3 rebounds (79), 8.9 assists (62), 2.57 steals (18) and 2.29 blocks (16) against Golden State...is the first player in NBA history to lead all players in all five categories for an entire playoff series…no other player in NBA history has also ever produced 208 points, 79 rebounds and 62 assists in one NBA Finals series…became the 5th player to win three Finals MVPs; the others are Michael Jordan, Shaquille O'Neal, Tim Duncan and Magic Johnson…joined Kareem Abdul-Jabbar as the only players in NBA history to win Finals MVP with multiple teams and the 4th player to win 3 Finals MVPs and 4 regular season MVPs (Michael Jordan, Bill Russell and Kareem Abdul-Jabbar)…his 29.7 points-per-game average in the Finals was the highest by a player on the winning team in any seven-game Finals series in NBA history…connected on two three-pointers in Game 1 of the NBA Finals at Golden State on June 2 to become the all-time Finals leader in threes (57), one more than Robert Horry and Ray Allen; currently has 68 triples for his NBA Finals career…in Game 5 of the Finals, had 41 points on 16-30 (.533) shooting, including 4-8 (.500) from deep, a game-high 16 rebounds, seven assists, three steals and three blocks in 43 minutes; joined Shaquille O'Neal (2001), Magic Johnson (1980) and Cliff Hagan (1961) as the only players in NBA history to score at least 40 points, grab 15 rebounds and dish out at least five assists in a Finals game…in Game 6 of the Finals on June 16, tallied 41 points on 16-27 (.593) shooting, eight rebounds, 11 assists, four steals and three blocks in 43 minutes; it was his second straight 40-point contest, becoming just the 5th player with at least 40 points in consecutive NBA Finals games (Games 5-6), joining Jerry West (1965 and 1969 Lakers), Rick Barry (1967 Warriors), Michael Jordan (1993 Bulls, doing so in four straight games), and Shaquille O'Neal (2000 Lakers)…after tallying 27 points, 11 rebounds and 11 assists in Game 7, became the 3rd player to have a triple-double in Game 7 of the NBA Finals (James Worthy 1988, Jerry West 1969)…played in all 20 games during the Cavs’ NBA Finals run in the 2015 Playoffs, recording an NBA-high 14 double-doubles (three triple-doubles) and averaging 30.1 points, 11.3 rebounds, 8.5 assists, 1.7 steals and 1.1 blocks in 42.2 minutes per game…first player since Oscar Robertson to produce 30.0 points, 11.0 rebounds and 8.0 assists in a single postseason…in the First Round series against Boston, averaged 27.0 points, 9.0 rebounds, 6.5 assists, 2.3 steals and 1.5 blocks in 43.0 minutes…in the six games against Chicago in the Eastern Conference Semifinals, averaged 26.2 points, 11.0 rebounds and 8.8 assists to go along with five double-doubles; became the first player since Magic Johnson in 1991 to finish a series with averages of 25 points, 10 rebounds and eight assists…drained a 21-foot baseline jumper as time expired to give the Cavs an 86-84 victory in Game 4 of the Eastern Conference Semifinals at Chicago on May 10…in Game 5 of the Semifinals against Chicago, registered 38 points, 12 rebounds, six assists, three steals, three blocks and zero turnovers in 41 minutes, becoming just the third player in NBA postseason history to record at least 35 points, 10 boards, five assists, three steals and three blocks in a playoff game, joining Dwayne Wade (at Dallas 6/20/2006) and Elvin Hayes (vs. Buffalo 4/20/1975); since the league began recording turnovers in 1977-78, he is the only NBA player in playoff history to record that stat line while also having zero turnovers…in the Eastern Conference Finals against Atlanta, averaged a near triple-double with 30.3 points, 11.0 rebounds, 9.3 assists and 2.0 steals in 38.3 minutes per game; no other player in league history has ever averaged at least 30.0 points, 10.0 rebounds and 9.0 assists in a playoff series…in the Game 3 win over Atlanta in the Eastern Conference Finals on May 24, collected a triple-double with game-highs of 37 points, 18 rebounds (playoff career-high eight offensive) and 13 assists, to go along with three steals in 47 minutes; became the first player in NBA postseason history to put together a stat line of at least 37 points, 18 rebounds and 13 assists…in six games during the NBA Finals versus Golden State, recorded five double-doubles and two triple-doubles, while averaging 35.8 points, 13.3 rebounds, 8.8 assists and 1.3 steals in 45.7 minutes…became the first player in Finals history to lead the series in points, rebounds and assists…became the first player to produce two triple-doubles with 30 or more points in one Finals series…in Game 1 against the Warriors, tallied a 2015 Playoff-high 44 points, eight rebounds and six assists in 46 minutes…during Game 2’s win at Golden State on Jan. 7, registered a triple-double with game highs in points (39), rebounds (16) and assists (11), becoming the first player in NBA playoff history to reach those totals…in Game 5 against the Warriors, notched another triple-double with 40 points, 14 rebounds and 11 assists; only three other players scored 40 points in a playoff triple-double: Oscar Robertson (twice in 1963), Jerry West (1969), and Charles Barkley (1993)…became just the sixth player in NBA history to score 5,000 career playoff points after posting 32 points, 18 rebounds, nine assists and two steals in 47 minutes in Game 6 of the Finals on June 16…in the 2014 Playoffs, led Miami to its fourth straight NBA Finals appearance…played in 20 games (all starts) with averages of 27.4 points on .565 shooting, including .407 (35-86) from beyond the arc, 7.1 rebounds, 4.8 assists and 1.8 steals in 38.2 minutes per game…also shot a postseason career-high .806 (129-160) from the foul line…scored 22 points or more in all but one game, including seven 30-plus point performances…matched his postseason career high with 49 points on 16-24 (.667) shooting, six rebounds and three steals in 43 minutes at Brooklyn on May 12…recorded four double-doubles…ranked second in the playoffs in points per game…became the first player in NBA postseason history to average at least 27.0 points, 7.0 rebounds and 4.0 assists while shooting .500 from the field and .400 from the three-point line…averaged 30.0 points on .557 shooting, 8.0 rebounds, 6.0 assists and 2.3 steals in 39.3 minutes in the opening round sweep over Charlotte…also averaged 30.0 points on .570 shooting, 6.4 rebounds, 3.6 assists and 1.2 steals in 40.4 minutes in the semifinals 4-1 series against Brooklyn…in the Eastern Conference Finals versus Indiana, averaged 22.8 points on .559 shooting, 6.3 rebounds, 5.5 assists and 1.8 steals in 35.8 minutes per game…In the NBA Finals against San Antonio, notched two double-doubles and averaged 28.2 points on .571 shooting, including .519 (14-27) from the three-point line, 7.8 rebounds, 4.0 assists and 2.0 steals in 37.8 minutes per game…tallied 35 points and 10 rebounds in 38 minutes in Game 2’s win over the Spurs…in the 2013 Playoffs, started all 23 games for the NBA Champion Heat and averaged 25.9 points (.491 FG%, .777 FT%), 8.4 rebounds, 6.6 assists, 1.78 steals and 41.8 minutes…was named MVP Finals MVP for the second straight year…led the Heat in points, scoring average, field goals made and attempted, free throws made and attempted, defensive and total rebounds, assists, steals, dunks and minutes and tied for the lead in three-point field goals attempted…topped Miami in scoring 18 times, in minutes 22 times, in assists in 17 occasions, in rebounds 13 times and in steals 12 times (all team highs)…also topped the squad in blocks five times…scored in double figures in all 23 games, including 18 games with at least 20 points and eight games with 30-or-more points…grabbed double-figure rebounds seven times and handed out double-figure assists three times…recorded seven double-doubles and three triple-doubles…averaged 24.5 points (.627 FG%, .700 FT%), 7.8 rebounds, 6.8 assists, 1.00 steals and 36.8 minutes in the Opening Round vs. Milwaukee…led Miami in points, scoring average, field goals made and attempted, field goal percentage, free throws made and attempted, assists and minutes vs. the Bucks…averaged 23.6 points (.438 FG%, .808 FT%), 7.8 assists, 7.0 rebounds, 2.20 steals and 41.6 minutes in the Eastern Conference Semifinals vs. Chicago…led the Heat in points, scoring average, field goals made and attempted, free throws made and attempted, assists, steals and minutes vs. Chicago…averaged 29.0 points (.510 FG%, .778 FT%), 7.3 rebounds, 5.3 assists, 1.43 steals, 1.43 blocks and 43.4 minutes in the Eastern Conference Finals vs. Indiana…led Miami in points, scoring average, field goals made and attempted, three-point field goals made and attempted, free throw made and attempted, defensive and total rebounds, assists, blocks and minutes and tied for the team lead in steals vs. Indiana…recorded a triple-double with 30 points, 10 rebounds and 10 assists and hit a game-winning lay-up at the buzzer in overtime in Game 1 on May 22…averaged 25.3 points (.447 FG%, .795 FT%), 10.9 rebounds, 7.0 assists, 2.29 steals and 43.0 minutes in the NBA Finals vs. San Antonio…led Miami in points, scoring average, field goals made and attempted, three-point field goal attempts, free throws made and attempted, defensive and total rebounds, assists, steals and minutes vs. the Spurs…posted a pair of triple-doubles in the Finals…had 18 points, 18 rebounds (including 16 defensive to tie his postseason career high) and 10 assists in Game 1 on June 6 and 32 points, 11 assists and 10 rebounds in Game 6 on June 18…had a game-high 37 points (his 2013 postseason high) and a team-high 12 rebounds in Miami’s Game 7 title-clinching victory on June 20…during the 2012 Playoffs, started all 23 games for the NBA Champion Heat and averaged 30.3 points (.500 FG%, .739 FT%), 9.7 rebounds, 5.6 assists, 1.87 steals and 42.7 minutes…was named the unanimous MVP of the NBA Finals…led the Heat in points, scoring average, field goals made and attempted, field goal percentage, free throws made and attempted, offensive rebounds, defensive rebounds, total rebounds, assists, steals and minutes...topped Miami in points a team-high 19 times and also led the squad in minutes 17 times, in steals 13 times, in assists in 12 contests, in rebounds 10 times and in blocks on five occasions…scored in double figures in all 23 games, including 22 games with at least 20 points, 13 games with 30-or-more points and a pair of 40-point efforts…set a postseason franchise record for most consecutive 30-point games with five (June 5-14)…grabbed double-figure rebounds 10 times and handed out double-figure assists twice…recorded 11 double-doubles and one triple-double…averaged 27.8 points (.478 FG%, .807 FT%), 6.2 rebounds, 5.6 assists, 2.20 steals and 37.8 minutes in the Opening Round vs. New York…led Miami in points, field goals attempted, free throws made and attempted, assists and minutes and tied for the team lead in field goals made and defensive rebounds vs. New York…averaged 30.0 points (.504 FG%, .725 FT%), 10.8 rebounds, 6.2 assists, 2.67 steals and 42.6 minutes in the Eastern Conference Semifinals vs. Indiana…topped Miami in points, field goals made and attempted, offensive rebounds, defensive rebounds, total rebounds, assists, steals and minutes vs. Indiana…averaged 33.6 points (.527 FG%, .650 FT%), 11.0 rebounds, 3.9 assists, 1.29 blocks, 1.14 steals and 45.9 minutes in the Eastern Conference Finals vs. Boston…his 33.6 ppg scoring average vs. Boston is the second highest individual series scoring average in Heat postseason history...led Miami in points, field goals made and attempted, free throws made and attempted, defensive and total rebounds and minutes vs. Boston…with Miami facing elimination in Game 6 at Boston on June 7 he tallied 45 points, 15 rebounds and five assists while shooting 19-26 (.731) from the floor…his 19 field goals made in Game 6 set a Heat single-game postseason record…matched his postseason career highs in both free throws made (18) and attempted (24) in Game 2 vs. Boston on May 30…averaged 28.6 points (.472 FG%, .826 FT%), 10.2 rebounds, 7.4 assists, 1.60 steals and 44 minutes in the NBA Finals vs. Oklahoma City en route to being named the unanimous MVP of the series…led Miami in points, field goals made and attempted, free throws made and attempted, defensive and total rebounds, assists and minutes vs. OKC and tied for the team lead in offensive rebounds…recorded only the second triple-double in Miami postseason history in the series-clinching Game 5 on June 21 as he tallied 26 points, a postseason career-high tying 13 assists and 11 rebounds…in the 2011 Playoffs, started all 21 games for the Heat and averaged 23.7 points (.466 FG%, .763 FT%), 8.4 rebounds, 5.9 assists, 1.67 steals, 1.19 blocks and 43.9 minutes…led Miami in minutes played, three-point field goals attempted, defensive rebounds, assists and steals and tied for the team lead in field goals attempted…topped Miami in scoring and rebounds eight times each, in minutes 18 times, in assists on 13 occasions and in blocks in six games…scored in double figures on 20 occasions, including 15 games with at least 20 points and five 30-point efforts…grabbed double-figure rebounds on seven occasions and handed out double-figure assists twice…posted eight double-doubles and one triple-double…averaged 24.2 points (.469 FG%, .820 FT%), 10.6 rebounds, 6.2 assists and 42.2 minutes in Miami’s Opening Round series vs. Philadelphia and led the team in points, free throws made and attempted, defensive and total rebounds, assists and minutes…averaged 28.0 points (.472 FG%, .667 FT), 8.2 rebounds, 3.6 assists, 1.80 steals, 1.80 blocks and 44.6 minutes in the Eastern Conference Semifinals vs. Boston…led Miami in field goals attempted, three-point field goals made and attempted and minutes vs. Boston and tied for the team lead in field goals made and blocks…averaged 25.8 points (.447 FG%, .864 FT%), 7.8 rebounds, 6.5 assists, 2.40 steals, 1.80 blocks and 45.2 minutes in the Eastern Conference Finals vs. Chicago…led Miami in points, field goals attempted, three-point field goals made and attempted, free throws made and attempted, offensive and total rebounds, assists, steals and minutes in the conference finals and tied for the lead in field goals made…averaged 17.8 points (.478 FG%, .600 FT%), 7.2 rebounds, 6.8 assists, 1.67 steals and 43.7 minutes in the NBA Finals vs. Dallas…led Miami in defensive rebounds, assists, steals and minutes in the Finals…recorded the first triple-double in Heat postseason history with 17 points, 10 rebounds and 10 assists in Game 5 at Dallas on June 9…during the 2010 Playoffs, started all 11 games for the Cavs and averaged 29.1 points (.502 FG%, .733 FT%), 9.3 rebounds, 7.6 assists, 1.82 blocks, 1.73 steals and 41.8 minutes…led Cleveland in points, field goals made and attempted, three-point field goals made and attempted, free throws made and attempted, defensive and total rebounds, assists, steals, blocks and minutes…scored in double figures in all 11 contests, including nine games with at least 20 points, five games with 30-or-more points and one 40-point performance…grabbed double-figure rebounds four times and handed out double-figure assists twice…recorded four double-doubles and two triple-doubles…averaged 31.8 points (.567 FG%, .720 FT%), 9.2 rebounds, 8.2 assists, 2.40 blocks, 1.20 steals and 40.8 minutes in Cleveland’s Opening Round series vs. Chicago…averaged 26.8 points (.447 FG%, .743 FT%), 9.3 rebounds, 7.2 assists, 2.17 steals, 1.33 blocks and 42.3 minutes in the Eastern Conference Semifinals vs. Boston…during the 2009 Playoffs, started all 14 games for Cleveland and averaged 35.3 points (.510 FG%, .749 FT%), 9.1 rebounds, 7.3 assists, 1.64 steals and 41.4 minutes…led the NBA in scoring average…led the Cavs in points, scoring average, field goals made and attempted, field goal percentage, free throws made and attempted, defensive and total rebounds, assists and steals…scored at least 25 points in all 14 games, including nine games with at least 30 points and four 40-point performances…grabbed double-figure rebounds seven times, including a postseason career-high four consecutive games (Apr. 21-May 5)…handed out double-figure assists once…posted seven double-doubles and one triple-double…averaged 32.0 points (.506 FG%, .797 FT%), 11.3 rebounds, 7.5 assists, 1.50 steals and 40.8 minutes in Cleveland’s Opening Round sweep of Detroit…his 11.3 rebounds per game average vs. Detroit is his high for a postseason series…averaged 33.8 points (.556 FG%, .696 FT%), 8.3 rebounds, 6.0 assists, 2.50 steals and 37.8 minutes in the Eastern Conference Semifinals sweep of Atlanta…averaged 38.5 points (.487 FG%, .745 FT%), 8.3 rebounds, 8.0 assists, 1.17 steals and 44.3 minutes in the Eastern Conference Finals vs. Orlando…the 38.5 points per game scoring average vs. Orlando is his personal high in a playoff series…scored a Cavs playoff franchise-record 49 points vs. Orlando in Game 1 on May 20…made the game-winning buzzer-beating shot in Game 2 vs. Orlando on May 22…recorded his lone triple-double of the 2009 postseason with 37 points, 14 rebounds and 12 assists in Game 5 vs. Orlando on May 28 becoming the first player to record at least each of those numbers in a postseason game since Oscar Robertson on Mar. 21, 1963…in the 2008 Playoffs, started all 13 games for Cleveland and averaged 28.2 points (.411 FG%, .731 FT%), 7.8 rebounds, 7.6 assists, 1.77 steals, 1.31 blocks and 42.5 minutes…led the Cavs in points, scoring average, field goals made and attempted, three-point field goal attempts, free throws made and attempted, defensive and total rebounds, assists, steals, blocks and minutes…scored in double figures in all 13 games, including 12 games with at least 20 points, seven games with 30-or-more points and one 40-point performance…grabbed double-figure rebounds on four occasions and handed out double-figure assists three times…posted six double-doubles and one triple-double…averaged 29.8 points (.483 FG%, .701 FT%), 9.5 rebounds, 7.7 assists, 1.33 steals, 1.33 blocks and 41.3 minutes in the Opening Round series vs. Washington…averaged 26.7 points (.355 FG%, .756 FT%), 7.6 assists, 6.4 rebounds, 2.14 steals 1.29 blocks and 43.4 minutes in the Eastern Conference Semifinals vs. Boston…scored 45 points in Game 7 at Boston on May 18, the fourth highest individual point total scored in a Game 7 in NBA playoff history…during the 2007 Playoffs, started all 20 games for the Cavs and averaged 25.1 points (.416 FG%, .755 FT%), 8.1 rebounds, 8.0 assists, 1.70 steals and 44.7 minutes…led the Cavs in points, scoring average, field goals made and attempted, three-point field goal attempts, free throws made and attempted, defensive rebounds, assists, steals and minutes…scored in double figures in all 20 games, including 16 games with at least 20 points, six games with 30-or-more points and one 40-point performance…grabbed double-figure rebounds four times and handed out double-figure assists on four occasions…set a franchise record for double-doubles in a playoff season with eight…averaged 27.8 points (.425 FG%, .813 FT%), 8.5 rebounds, 7.5 assists, 1.75 steals and 45.5 minutes in Cleveland’s Opening Round sweep of Washington…averaged 24.7 points (.423 FG%, .754 FT%), 8.5 assists, 7.3 rebounds, 1.17 steals and 44.0 minutes in the Eastern Conference Semifinals vs. New Jersey…averaged 25.7 points (.449 FG%, .741 FT%), 9.2 rebounds, 8.5 assists, 2.67 steals and 46.2 minutes in the Eastern Conference Finals vs. Detroit…scored a then franchise-record 48 points on 18-33 shooting in Game 5 at Detroit on May 31…scored 29 of Cleveland’s final 30 points in Game 5, including each of their last 25 points overall…averaged 22.0 points (.356 FG%, .690 FT%), 7.0 rebounds, 6.8 assists, 1.00 steals and 42.5 minutes in the NBA Finals vs. San Antonio…during the 2006 Playoffs, started all 13 games for the Cavs and averaged 30.8 points (.476 FG%, .737 FT%), 8.1 rebounds, 5.8 assists, 1.38 steals and 46.5 minutes…led the Cavs in scoring, field goals made and attempted, three-point field goals made and attempted, free throws made and attempted, defensive and total rebounds, assists and minutes…scored at least 20 points in all 13 games, including eight games with 30-or-more points and a pair of 40-point efforts…grabbed double-figure rebounds four times and handed out double-figure assists twice…posted four double-doubles and a pair of triple-doubles…averaged 35.7 points (.510 FG%, .746 FT%), 7.5 rebounds, 5.7 assists, 1.33 steals and 47.2 minutes in Cleveland’s Opening Round series vs. Washington…his scoring average against the Wizards was the third highest in NBA history for a player in his debut series trailing only Wilt Chamberlain (38.7 ppg in 1960) and Kareem Abdul-Jabbar (38.2 ppg in 1970)…recorded a triple-double with 32 points, 11 rebounds and 11 assists in Game 1 vs. Washington on Apr. 22 to become only the third player in NBA history to record a triple-double in his postseason debut joining Johnny McCarthy and Magic Johnson…became the first player in NBA history to score over 40 points in his first road playoff game with 41 points in Game 3 at Washington on Apr. 28…averaged 26.6 points (.442 FG%, .727 FT%), 8.6 rebounds, 6.0 assists, 1.43 steals and 46.0 minutes in Cleveland’s Eastern Conference Semifinal series vs. Detroit. NOTABLE: A four-time MVP (2009, 2010, 2012, 2013) and three-time NBA Finals MVP (2012, 2013, 2016)…a three-time NBA champion (2012, 2013, 2016)…a two-time Olympic gold medalist (2008, 2012)…12-time NBA All-Star (2005–2016) and two-time NBA All-Star Game MVP (2006, 2008)…has started all 12 All-Star Games in which he has appeared and has averaged 24.2 points, 6.3 rebounds, 6.3 assists, 1.4 steals and 30.3 minutes while shooting 51.3 percent from the floor…among all-time leaders in the All-Star Game, James ranks first in points scored (291), first in three-pointers made (28), tied for first in field goals made (119), third in scoring average (24.2), sixth in assists (75) and tied for 10th in steals (17)…10-time All-NBA First Team selection (2006, 2008–2016)…two-time All-NBA Second Team selection (2005, 2007)…five-time NBA All-Defensive First Team selection (2009–2013)….NBA All-Defensive Second Team selection in 2014…has been selected the NBA Eastern Conference Player of the Month a league-record 32 times: 15-16 three times (Feb., March, April), 14-15 two times (Feb. & March), 13-14 twice (Dec. & Feb), 12-13 five times (Nov., Dec., Jan., Feb. & March), 11-12 twice: (Dec./Jan. & Feb.), 10-11 three times (Dec., Jan. & April), 09-10 four times (Nov., Dec., Jan. and Feb.), 08-09 four times (Nov., Jan., March & April), 07-08 two times (Jan. and Feb.), 06-07 once (March), 05-06 twice (Nov. & March) and 04-05 twice (Nov. & Jan.)…became the first player in NBA history to win the Player of the Month award in five consecutive months in the same season when he accomplished the feat the first five months of the 2012-13 season…the NBA Eastern Conference Player of the Week a league-record 53 times: 15-16 five times (week ending Nov. 22, Jan. 10, March 6, March 27 and April 3), 14-15 three times (week ending Nov. 16, Nov. 30 & Jan. 25), 13-14 twice (Nov. 18 & Dec. 2), 12-13 six times (Nov. 11, Nov. 18, Dec. 23, Feb. 10, Feb. 24 & Mar. 24), 11-12 six times (Jan. 1, Jan. 8, Jan. 29, Feb. 19, Apr. 8 & Apr. 22), 10-11 five times (Dec. 26, Jan. 9, Jan. 30, Feb. 6 & Mar. 20), 09-10 six times (Nov. 22, Dec. 27, Jan. 10, Jan. 24, Feb. 7 & Feb. 28), 08-09 NBA-record seven times (Nov. 9, Nov. 16, Dec. 28, Jan. 25, Feb. 8, Mar. 15 & Mar. 22), 07-08 three times (Nov. 25, Jan. 6, Feb. 24), 06-07 twice (Nov. 19 & Mar. 11), 05-06 five times (Nov. 20, Jan. 29, Mar. 19, Mar. 26 & Apr. 2), 04-05 three times (Nov. 14, Nov. 28 & Jan. 23)…has led the NBA in field goals made in four different seasons (07-08, 10-11 & 12-13), in triple-doubles three seasons (08-09, 09-10, 10-11,) and in scoring average (07-08), free throws made (08-09) and minutes per game (04-05) one season each…the 2012 Sports Illustrated Sportsman of the Year…was named the USA Basketball 2012 Male Athlete of the Year…in 2011-12, became only the second player ever to receive the NBA Finals MVP (was the unanimous winner) and NBA regular season MVP and capture the NBA championship and a gold medal with the United States Senior National Team (in London, England) in the same year (joining Michael Jordan who accomplished the feat in 1992)…received the NBA’s Community Assist Award for June 2008, June 2006 and August 2004 (with his Olympic teammates)…was a starter for the Sophomore Team in the Rookie Challenge at the 2005 All-Star Weekend in Denver…named the NBA Rookie of the Year, a unanimous All-Rookie First Team selection and was the Eastern Conference Rookie of the Month all six months of the 2003-04 season…during the 2012 Olympics, started all eight games for the USA Basketball Senior National Team which won the gold medal in London, England and averaged 13.3 points (.603 FG%, .750 FT%), 5.6 rebounds, 5.6 assists, 1.83 steals and 25.1 minutes…led the team in assists…recorded the first triple-double in U.S. Olympic history with 11 points, 14 rebounds and 12 assists vs. Australia in the quarterfinal round on Aug. 8…topped the team in assists four times, in minutes three times and in points, rebounds and steals once each…in the 2008 Olympics, started all eight games for the USA Basketball Senior National Team which won the gold medal in Beijing, China and averaged 15.5 points (.602 FG%, .458 FT%), 5.3 rebounds, 3.8 assists, 2.38 steals, 1.00 blocks and 24.8 minutes…led the team in minutes played, field goals made and blocks…topped the team in scoring once and rebounds twice…during the 2004 Olympics, was a member of the bronze medal winning USA Basketball Senior National Team…came off the bench in all eight games and averaged 5.4 points (.594 FG%, 1.000 FT%), 1.6 assists and 1.0 rebounds…became the youngest professional player ever to be a member of the U.S. Senior National Team. PERSONAL: Full name is LeBron Raymone James…is the son of Gloria James…married his high school sweetheart Savannah Brinson on Sept. 14, 2013…has two sons (LeBron James Jr. and Bryce Maximus James) and one daughter (Zhuri)…has his own website (www.lebronjames.com) and one for his Foundation (www.lebronjamesfamilyfoundation.org)...launched the LeBron James Family Foundation in 2004 with a mission to positively affect the lives of children and young adults through education and co-curricular educational initiatives…in 2015, he played himself in the Judd Apatow film Trainwreck…executive producer of Starz sitcom Survivor's Remorse and CNBC’s Cleveland Hustles…James' digital video company, Uninterrupted, is hosted on Bleacher Report and is used by several other athletes…elected as vice president of the National Basketball Players Association on Feb. 13, 2015…in 2011, in partnership with the Akron Public Schools, the LeBron James Family Foundation launched its pillar program, “Wheels for Education”, with its mission to improve graduation rates in Akron, this groundbreaking initiative targets third graders and provides them with the programs, support and mentors they need for success in school…through his Foundation, he also delivered on his promise to his high school alma mater, St. Vincent-St. Mary, to rebuild the gymnasium and outfit all student-athletes with brand new Nike uniforms...in 2012, he pledged $1 million to renovate his old stomping grounds at St. Vincent-St. Mary High School as the completion of The LeBron James Arena had its ceremonial grand opening on December 14, 2013…he and his Foundation also work regularly with the Boys and Girls Clubs of America, renovating a local Boys and Girls Club in every All-Star host city each year, an initiative that began in 2008 in New Orleans and continues today…has endorsement partnerships with Nike, Audemars Piguet, Beats by Dre, Coca-Cola, Dunkin’ Brands, McDonald’s, Samsung, State Farm, Tencent, and Upper Deck…had animated web series “The LeBrons” that had two seasons on YouTube…in September 2008, More Than a Game, executive produced by LeBron James and Maverick Carter, debuted at the Toronto Film Festival, finishing up as runner-up to the eventual Academy Award winner Slumdog Millionaire…released in October 2009, the film chronicles LeBron and his teammates at St. Vincent-St. Mary High School and their seven-year journey which culminated with a national high school championship…co-authored the book Shooting Stars with Buzz Bissinger which was released in 2009 and chronicled the St. Vincent-St. Mary High School team that overcame adversity to fulfill their dream…hosted Saturday Night Live on Sept. 29, 2007 and co-hosted the 15th Annual ESPY Awards on July 11, 2007…grew up idolizing Michael Jordan and the Chicago Bulls and is a fan of the New York Yankees and the Dallas Cowboys… wore number 23 in high school and the first seven years of his NBA career as a tribute to Jordan…led St. Vincent-St. Mary High School to three state championships and was named the consensus 2003 National High School Player of the Year…was named PARADE magazine’s High School Boys Player of the Year as both a junior and senior to become the first repeat winner…won Ohio’s Mr. Basketball Award his final three seasons, becoming the first sophomore to earn the honor…also played football in high school through his junior year before giving it up to concentrate on basketball…was named First Team All-State as a wide receiver his sophomore year…wears size 16 sneakers.